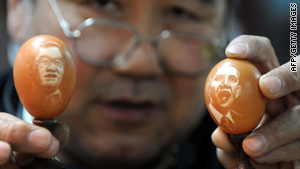 Chinese artist Kang Yongguo shows off egg paintings Sunday of President Obama and President Hu Jintao. In Shanghai Obama will hold town hall-style meeting with "future Chinese leaders"
(CNN) -- U.S. President Barack Obama is expected on Monday to meet with the Shanghai mayor and hold a town hall-style meeting with "future Chinese leaders" before heading to Beijing to meet his host, Chinese President Hu Jintao. Trade issues are likely to be a major discussion topic between the two leaders; the United States imports billions of dollars in Chinese products each year. At local markets, Chinese government officials banned a popular Obama shirt over fears that it would offend their guest. It depicts Obama wearing a Chinese Communist outfit made famous by Mao Zedong, the late Communist leader. The back has "Oba-Mao" printed on it. Obama's visit comes as China relishes its spot as a key global player. It is involved in major international disputes such as the showdowns with Iran and North Korea and has used its position on the U.N. Security Council and its economic leverage to influence events around the globe. China also is now the dominant regional player in northeast Asia, recently hosting a summit in Beijing with the Japanese and South Korean leaders. The nation's economic expansion has led to a demand for raw materials around the world and the rapid expansion of China's presence in countries such as Guinea, Myanmar, Sudan and Venezuela. Human rights groups say China is propping up repressive regimes to secure its access to critically important raw materials. China's rapid economic expansion outpaces growth in the United States, 8.9 percent in the past quarter versus 3.5 percent in the United States, giving Beijing huge economic leverage. Obama's half-brother Mark Obama Ndesandjo lives in Shenzhen in southern China. Ndesandjo, an engineer by trade, moved from the United States after losing his job seven years ago. Ndesandjo took the last name of the man his mother remarried and has dodged the media since Obama was elected president. He spoke to reporters about his semi-autobiographical book, "Nairobi to Shenzhen," earlier this month. He said their father was abusive and beat him and his mother. Ndesandjo owns a small chain of restaurants in Shenzhen and teaches piano to orphans. The White House did not say whether the president would see him during his trip. The final stop of his Asia trek is Seoul, where Obama will meet with South Korean President Lee Myung-bak and deliver a speech to American troops at Osan Air Base. Obama is on an eight-day journey that has also taken him to Japan and Singapore, where he attended the Asia-Pacific Economic Cooperation summit and the Association of Southeast Asian Nations economic forum. He'll return to the United States on Friday.